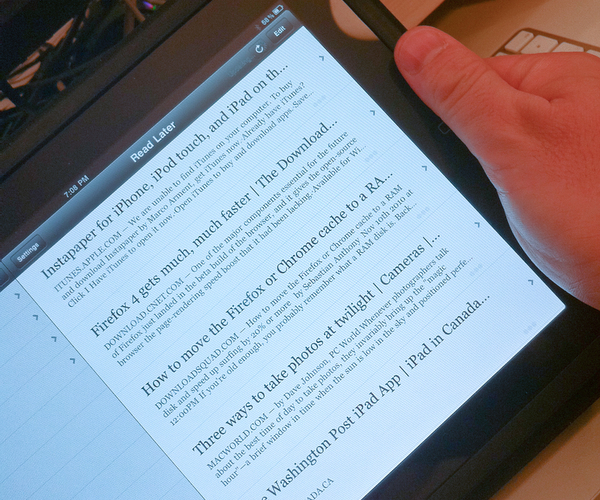 – Article list on iPhone now includes the first few lines of text from articles, like on iPad. On iPad, more text is now shown. The text is downloaded for new articles only: RE-DOWNLOAD ALL ARTICLES in Settings for it to apply to your previously downloaded articles. – Article list now indicates approximate article length and progress with a row of dots, similar to how it’s done on a Kindle’s home screen. – iPad updates are MUCH faster. – iPhone can now toggle Dark mode from articles, like iPad, in the font panel. – Overhauled logins to tolerate username changes, give more helpful errors, and fix the “username is already taken” bug. – New Sharing options: Send to OmniFocus, Send to QuickReader (supported by its next version), Copy Link, Copy Article Text. Also fixed sharing bugs with Twitter and Twittelator Pro. – New option to skip the in-app Browser and open links directly in Safari. – New feature to verify that you’re using the same account in the app and Mobile Safari and sync to your choice of accounts if they differ. – Simplified bookmarklet installation and improved help text. – Fixed handing of in-page anchors (including most footnotes) and mailto: links. – Added support for the “ihttp://” URL scheme, so if you can’t get the bookmarklet, the email address, or Copy working to add pages, you can edit Safari’s URL field and insert an “i” before the “http://”, tap Go, and Instapaper will launch and offer to add that page. Beyond that faster iPad updates—which I tested and is much faster than before—I like the new ihttp:// option for saving pages to Instapaper when the bookmarklet doesn’t work (or isn’t terribly convenient like on the iPhone), going right to Safari over the internal browser, and the slew of new sharing options (copying info directly is going to save me a ton of time!). That’s just the iPad version! On the iPhone, previously you just saw the title and site, now you get a few lines of text for each article you save and like the iPad, the updates are faster (or at least it seemed that way to me) that previous versions. It’s important to note that these updates are for the pay version of Instapaper not the free version of Instapaper (the free version is designed for the iPhone anyway). I have Instapaper as a crucial part of my workflow. Often I’m reading posts and news on the go or just need to stash something for later. Regardless of where I read and find news now, I can save it or retrieve it when I need it. Instapaper is one of those crucial apps that just saves you from having to bookmark and remember tons of articles that you might only need for a little while or just need to gather for the moment.